Very Good. 075154048X ALL BOOKS SHIPPED WITHIN 1 DAY OF PURCHASE! This was an older book, but the condition was just great. It was one that was missing in a friend of mine's collection of his writings and I gave it to her for a gift. I've used this seller before, and will return again! I loved this book it brought a smile to my face and a tear to my eye. I highly recommend it. A hardcover book for this price was a great deal; I just wish someone would have stated that it was large print. THIS IS THE NOVEL THAT MADE ME FALL IN LOVE WITH SPARKS' LOVE STORIES. 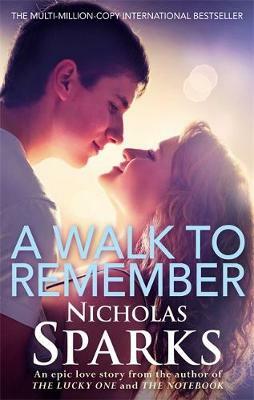 A WALK TO REMEMBER WAS THE FIRST BOOK OF HIS I EVER READ AND I WAS IN JUNIOR HIGH AT THE TIME. IT IS SUCH A GREAT NOVEL ABOUT FAITH AND LOVE THAT IT MAKES YOU FEEL LIKE YOUR THERE. I HAVE BEEN HOOKED ON HIS NOVELS EVER SINCE AND HAVE READ AND RECOMMEND ALL 14. Won't want to put this down! If you watched the movie and didn't read this book you are missing out!!! There are quite a few key scenes in the book that are not in the movie. The book is so well written. You will fall in love with the romance between Landon and Jamie. This is what you call true romance!